google-site-verification: google82af41cbbb927c7d.html Grove Creek Family History: New Views on FamilySearch! 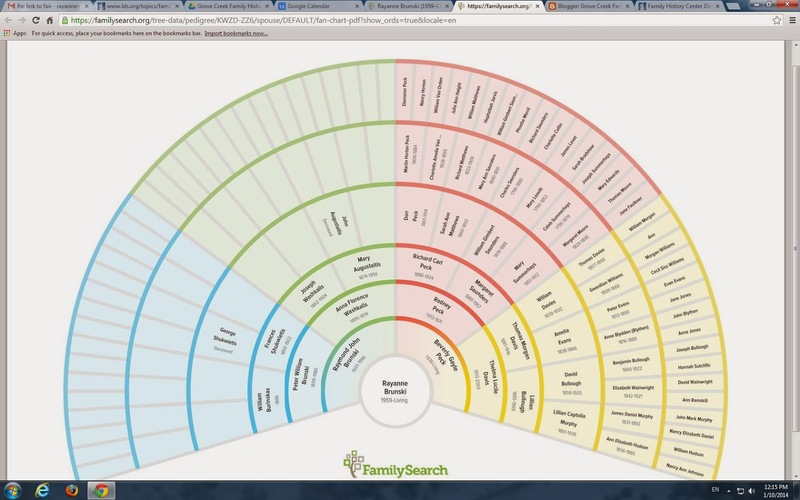 A new portrait view has been added to the Family Tree by FamilySearch. Below is a peak at it. To navigate to the portrait view, go to the options bar in the top left corner and click the down arrow. The three options available will be View Portrait, Traditional, Fan Chart. Did you know that you can see a seven generation fan chart of your family tree in addition to the standard five generation fan chart? Here is what the five generation fan chart looks like. Forgive me for chopping off the live children at the bottom! If you want the seven generation fan chart, click on the printer icon right underneath the bar that says "view fan chart." This is what you will see. As you can see, I have a lot of research to do! My dad's family continues to be elusive!